This summer marks a new era in wind power. The world’s first commercial scale floating offshore wind farm is taking shape off Peterhead in Scotland. 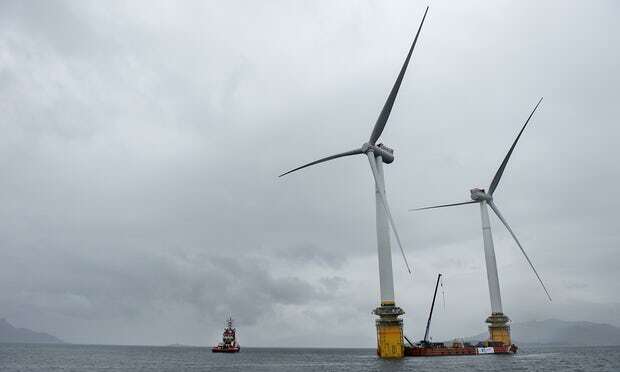 The Hywind project is just 30MW, so small for a commercial wind farm, but groundbreaking in that the turbines are floating rather than standing on the seafloor. This is hugely significant. Offshore wind has so far been restricted to shallow continental shelf areas such as the North Sea. Many areas of the world wish to develop more diverse renewable energy portfolios but do not have much in the way of suitable shallow waters. Japan and Korea, California and Hawaii, France and many other countries look set to develop floating offshore wind systems over the next decade or so. Currently the cost is higher than for traditional offshore wind, but it is projected to fall as systems are scaled up. 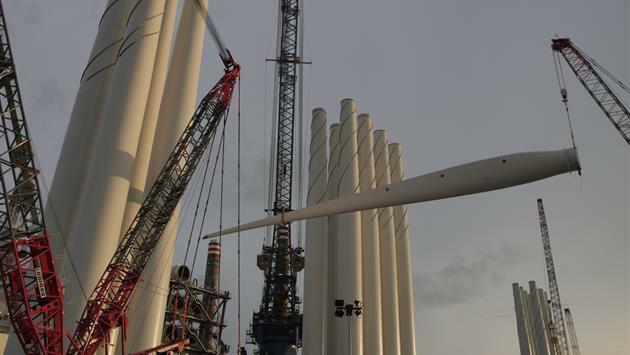 Norwegian oil and gas company Statoil has designed and built the system, using five Siemens 6MW turbines, and a range of other companies for various parts of the supply chain. The towers will have a total height of 258 metres, 178 metres above water and 80 metres below. The base will be filled with iron ore to give ballast and be tethered to the seabed. The turbines are assembled on the Norwegian fjord of Stord and floated in their vertical state across the North Sea. This allows very fast deployment, about seven weeks for the whole wind farm. As things are scaled up this will become a very important area of cost saving. Compare this to the decade or so involved to build a typical nuclear power station. The Hywind project is 75% owned by Stadoil and 25% by Masdar. Stadoil refer to this as a pilot project. If it works well in the testing conditions off North East Scotland global orders will come in, which will trigger falling costs and more orders. I think it likely that very large floating windfarms in the deep water off Japan, Korea, California and the Breton coast of France will be built over the next decade. Will it be Stadoil who builds them or will rival firms emerge with better and cheaper designs? This entry was posted in Energy on 24 July 2017 by Richard. Today, 11th July, is the UN World Population Day. There are now nearly 7.6 billion of us, and the predictions are that by 2050 there will be 9.5 billion, and 11.2 billion by 2100. Global fertility rates are falling, but still we have an extra 83 million people to feed, house and cloth each year. Africa has the fastest rate of growth and Europe the slowest. There have been many predictions of imminent famine and collapse due to overpopulation, as global food production would fail to keep pace with population growth. Also as the world’s poor aspired to rich world lifestyles the total ecological footprint of humanity would become catastrophic. Pollution would become more extreme and resources ever more scarce and the reason for endless wars. However there is another possibility. Through peaceful cooperation humanity can collectively pioneer a new kind of global economy that rapidly eliminates the hunger and poverty of the world’s poorest people and the excess and waste of the world’s richest people. Together we as a species have the opportunity to work out sustainable solutions to all our problems, to restore biodiversity while feeding clothing and housing our growing population in ways that are socially just and ecologically sustainable. I’m sure it can be done, at least theoretically. To make it a reality will require the almost infinite creativity and capacity to cooperate that our species is capable of. I meet a growing number of people who are keen to play their part in this great transformation of the global economy. As Buckminster Fuller said back in the 1960’s ‘We are called to be architects of the future, not its victims’. “Can we feed 9 billion people, sustainably?” is the title of a talk I’m giving tomorrow evening at De Koffie Pot, and was the theme of last week’s blog. This entry was posted in Environmental, Food & Farming, Miscellaneous on 11 July 2017 by Richard. The Seed Festival will be taking place at Hawkwood Collage, near Stroud, this weekend. The line up of speakers is terrific, including Caroline Lucas, Molly Scott Cato and Rob Hopkins, all of whom I’ve heard before and am keen to hear again, and also lots of not so well known names speaking on a great range of interesting themes. I’m on a Choices Panel with Louise Davies of the Vegan Society and Ed Downing. There will be varied other activities and music amid a lovely setting. Tickets are still on sale, so if you’re looking for something inspiring, with lots of positive solution focused thinking, do come and join us! This entry was posted in Miscellaneous on 6 July 2017 by Richard.